I am a simple man, with simple pleasures. A sharp IPA, for instance, paired with a Knickerbocker game, is usually enough to do the trick. But very few things please me, in the simplest sense, as Mike Francesa, WFAN's afternoon sports talk radio host. Francesa first came to my attention in 1989, when he and his then-partner, Chris "Mad Dog" Russo, debuted their show, "Mike and the Mad Dog," on the FAN. I remember a billboard, positioned near the merger of New Jersey Routes 46 and 3, with caricatures of Don Imus, the station's new morning host, and Mike and the Mad Dog. Imus, drawn with a cowboy hat and matching scowl, held a baseball, I believe, Russo, a baseball and Francessa, a football. The ad's tagline, roughly the size of a Winnebago, read: "We Got New York Sports By the Balls." Subtlety, I realize now, was never the station's intent. Truth be told, it took me some time to figure out I wasn't supposed to take these guys seriously, like at all, and certainly not as seriously as they took themselves. "Mike and The Mad Dog" worked. Russo's manic energy complimented Francesa's saturnine disposition. Believe me when I write the show was an institution. It ran, uninterrupted, for 19 years, until 2008. Bill Simmons, who thought enough of the show to live blog a 2006 broadcast, described its charm. For five hours every day, you feel like you're listening to two guys arguing at a sports bar.... With Mike and the Dog, radio doesn't feel contrived or forced, you don't have to listen to guys screaming and fake-laughing at each other's jokes, and they will absolutely not pander to the "hot button" subjects of the day. They're just [talking] for five hours. Here is a typical Russo and Francesa exchange, simulcast on the YES Network in the days after the Mets, a regular Francesa and Russo target, fired manager Willie Randolph on the West Coast, in the middle of the night, on Father's Day weekend. Russo gets worked up and Mike chimes in with his immutable laws of termination and decorum, something the Mets, in their infinite stupidity, failed to take into account. A bad job by them, in Russo's parlance. And here's a clip of the duo, lost amidst the drifts of the February sports season, discussing the Oscars, radio at its best. Sadly, the show is no more. Disgruntled over his contract negotiations with the FAN, Russo took his ball and went over to Sirius, Howard Stern's backyard. Francesa still broadcasts his own five-hour show on the FAN, five days a week, plus one three-hour show Sunday mornings during football season. That's basically 30 hours a week monologuing about New York sports, true yeoman's work. I listen to about 14 of those, and in that time, I've come to anticipate Francesa's overreactions and idiosyncrasies, which are legion and more pronounced in Dog's absence. He sometimes forgets, for instance, he's the only voice in the booth. I don't mean to be ungenerous. I admire his craft, no matter how unpolished it sometimes is. Sports talk radio is predicated on getting a rise out of listeners, and nobody does this better, or as effortlessly, as Francesa. The way he works over Mets and Jets fans, the majority of the station's callers, is nothing short of masterful. Rex Ryan, and his classless Jets, are arguably the best thing to happen to Francesa since Chris Russo. What I like best, though, are Francesa's arcane, often dubious, ruminations on such subjects as fungibility, Shake Shack, vacation days, "da witchin' hour," Mickey Mantle, and Lady Gloria Stewart. Also of note is his impatience, near disdain, for the majority of his callers, in particular Mike in Montclair, a constant thorn in his side. All of this is, of course, silly, probably juvenile, but Francesa's show continues to reward me with the simplest of pleasures. 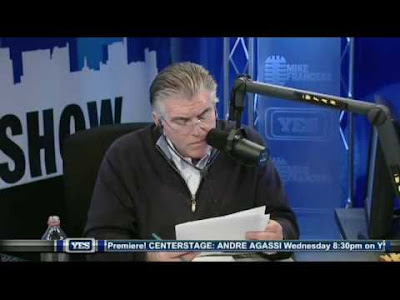 Have you visited themikefrancesa.com or thechrisrusso.com? They're both a great place to talk sports & Mike & the Mad Dog.